Interested in experiencing the Sport of Kings, Try a 2 hour Polo Clinic! Many of our Sunday spectators attend a Sunday match and leave with a desire for more. The Houston Polo Club offers 2 hour polo clinics for both beginners and advanced clinics for experienced players with instruction by one of our professional Polo Instructors. Beginners learn proper polo riding on a gentle polo school horse and mallet swing instruction in our special polo hitting cage. Experienced players can sharpen their skills on professional polo horses. Attending a polo clinic is an excellent way to prepare for the next step to our 8 week polo school program. Minimum age is 11. Contact us at playpolo@thehoustonpoloclub.com to book your clinic today! Founded in 1928, the Houston Polo Club is an established institution recognized for excellence in the sport of polo and equestrian pursuits. Celebrating our 89th year, Houston Polo Club is Houston’s oldest sports franchise. Like Houston’s other athletic pursuits, Houston Polo Club continues to produce top athletes in their sport. Much of the credit is owed our successful polo school. Too busy for a set schedule or prefer one on one riding instruction? 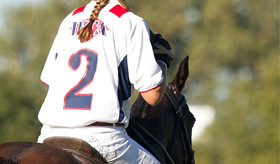 Our USPA certified Instructor offer one on one polo lessons for ages 11- adults. Stick with a polo lesson plan and you could be riding in the following season polo league! We offer individual or group lessons. Our extended lesson plan requires a riding or polo membership. Why plan another boring hotel meeting when you can host your next corporate event learning the great sport of polo? A polo clinic at the Houston Polo Club provides clients and or peers with a truly unique, unforgettable experience. NO PREVIOUS RIDING EXPERIENCE IS NECESSARY. Beginning in a small arena, our horses are gentle and well-trained, and the instruction is superb. Participants will leave with a polo ball, t-shirt and an experience that will be the envy of their corporate peers! Polo Clinics are two to three hours long and consist of riding a polo pony, swinging a foot mallet and a round in our iron horse hitting cage. We provide horses, tack and helmets. Based on availability, please contact for pricing.